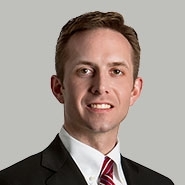 St. Louis Litigation partner Jeff Schultz was featured as a “St. Louis Character” in this week’s issue of the St. Louis Business Journal. In the full-page feature, Jeff shares some background on why he became a lawyer; interesting highlights from his legal practice including a time he went dumpster diving on behalf of a client; and his love of bluegrass music and classic cars. Jeff is an experienced business litigator who has extensive knowledge about the field of data security and privacy. This background led him to be named co-leader of the firm’s Privacy and Data Security practice area and former chair of The Missouri Bar’s Technology and Computer Law Committee. Jeff is a Certified Information Privacy Professional (CIPP/US) through the International Association of Privacy Professionals. As a litigator, Jeff routinely represents individuals and organizations in complex commercial disputes, including those involving the misappropriation of trade secrets, computer tampering, nondisclosure and noncompete agreements, commercial contracts and shareholder disputes. He is a sought-after writer, speaker and adviser on the topics of noncompete agreements, trade secrets, computer tampering, data security and social media. The story appears in the Friday, Nov. 17 issue. To read the full article, click here (subscriber only content).